After a crowdfunding effort to accumulate 2.5 BTC from users DJM34 has released a faster open source NeoScrypt kernel (source). Apart from the NeoScrypt the rest is based on the latest ccMiner form from SP version 1.5.78 that uses CUDA 7.5, so it is pretty much useful only if you are mining NeoScrypt-based altcoin. We have compiled a Windows 32-bit binary of the new ccminer djm34 neoscrypt fork with faster NeoScrypt using VS2013 and CUDA 7.5 as well as CUDA 6.5 (two versions available), compatible only with Nvidia Maxwell GPUs (Compute 5.0 and 5.2). Below we have compared the Neoscrypt performance using GTX 970 of this new release with the ccMiner 1.5.74 from SP with CUDA 6.5 and ccMiner 1.5.78 from sp with CUDA 7.5 to see what is the performance gain. 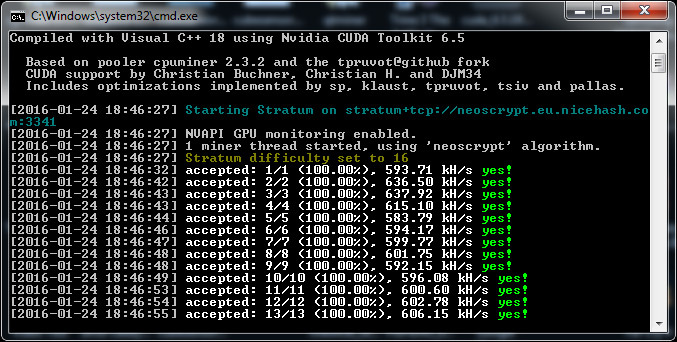 Note that the initial ccMiner releases from SP with CUDA 7.5 had brought a significant drop in performance in the NeoScrypt algorithm, so it was best to use 1.5.74 with CUDA 6.5 for NeoScrypt. Note that the comparison with 1.5.78 is with an earlier release that did not include the latest NeoScrypt kernel from djm34, because it seems that SP has integrated it in the latest GitHub code after the code has been released by djm34.